2. How do you prepare for a match? Here's an interesting look at Nick Barnes' preparations for calling Sunderland matches. How hard was it seeing some of the extremely hard comments on instagram/Facebook that accused you guys of being killers and just standing there? We all know nothing could be done, but seeing all of that when you’re just doing your job must have been tough. How do you know that it was starving due to lack of food, and not due to something like illness? Much of the criticism was aimed at the assertion or implication in the NatGeo article you linked that a lack of ice was the cause of the starvation. Numerous scientists and journalists have come out since then refuting that claim. I understand that you guys aren't responsible for writing the actual article, but what amount of input do photographers generally get in the editing process? 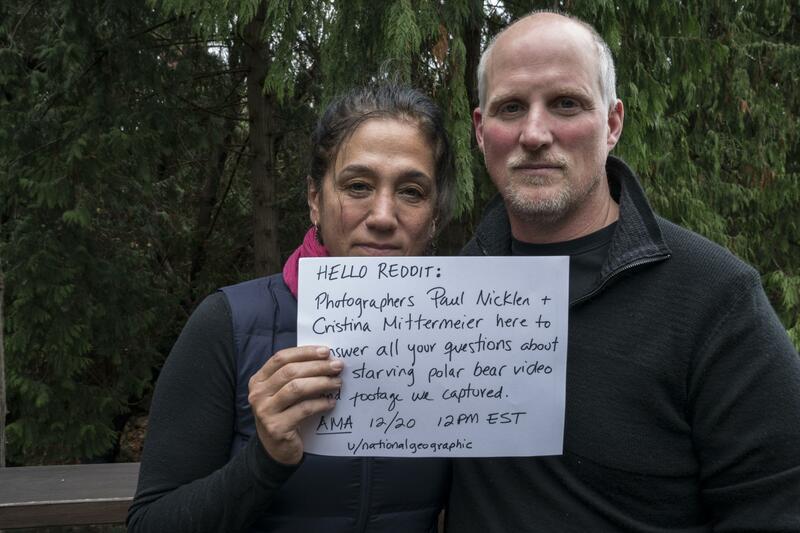 Were you sent out to find photos of starving bears? Or was the story and accompanying narrative developed around the photos? How do you deal with the possibility that your photos could be misinterpreted or misconstrued by editors? Well its certainly refreshing to hear that it wasn't you guys messing up. Kudos on you all for speaking up about this, you should not be wearing any of this. I have a question for people who saw this and thought it was out of the ordinary: How exactly do you think the average polar bear life ends? Curled up peacefully in a nursing home? Revenge murder by a pack of seals? Have you read the commentary from the local Inuit bear watchers? They have a very different narrative than the articles I have read. I read reports that you guys were standing there crying while filming the scene. Is that accurate? I have also seen supposed experts discuss the video saying that the bear is likely not starving exclusively because of climate change's effect on the bear's hunting environment, but that it is likely also sick with something that is causing it to be unable to hunt and get around as it should, likely some sort of bear cancer. Does that seem likely? Thanks for your reply. I haven't been able to bring myself to look at the footage myself, because I get too worked up just from the thumbnails and conversation around it. I'm sorry if I implied that you reported something inaccurately, that wasn't my intention, I was just trying to clarify some of the third-party conversation and speculation that I've heard regarding the footage. If you don't mind my asking, do you always manage to stay emotionally detached during the filming process, especially when it involves something so clearly heart wrenching? If no, what do you do to deal with it? I just wanted to thank you guys, and so many like you, who work in such harsh conditions to make knowledge about the state of the natural world so much more accessible to the layman. It's a good thing this footage has been the subject of debate, because it'll bring about more public interest. Thanks! How do we get Canada to change their legislation on being able to feed polar bears? Obviously there is a risk but we also have a duty to help them considering that we're destroying their habitats. What are your sources? The OP has proof she is who she says she is, but who are you and how do you know about the place where the Polar Bear died? We didn't see the polar bear again after he swam away. He looked more at ease in the water. Hi, could you share how you plan your photography work based on your conservation efforts? Wondering what factors go into what you decide to cover and when. Thanks for your work. Hey I'm glad you give us an opportunity to interact with you! I'm trying to reflect on what makes people react in different cultures. To your knowledge, what subjects engage western people most? In your experience, are polar bears the best way to make people talk about environmental change/damage in the west? You're in a much better position to know! What are some other species we should be paying closer attention to as far as our impact on their habitats? Oh perfect! Thanks very much. Hey guys.. thanks for bringing this powerful footage to light to showcase the issues climate change is having on the north. My question is a little different, but I was just curious as to what kind of camera gear you used to capture this footage? Thanks. Cristina, as you responded to media on the controversy surrounding the footage you suggested Inuit were denying climate change and are doing so to protect their sport hunts of the polar bear. Can you provide more insight ? Are Inuit really making a lot of money? What were your thoughts when you left the area where the polar bear was struggling? I personally would have felt dreadful, like i could have done something, despite there really being nothing I could do. I understand you couldn't legally help the poor thing, but being that close, experiencing its struggle, then leaving it must have been hard. And thank you for doing this. It's truly an eye-opening bit of footage.